Wine Concentrate Suppliers - California Concentrate Co. Established in 1935, we're California's oldest and most trusted wine concentrate supplier. Continue reading to learn about our history, our team, and our core values. For over 50 years, California Concentrate Company has produced high quality grape and fruit concentrates and juices at our plant in Acampo, California. Located in the Northern San Joaquin Valley, the region is world renowned for its ability to yield an abundance of crops, especially wine grapes. Dennis Alexander began the company to produce varietal grape concentrates for wineries and home winemakers alike. 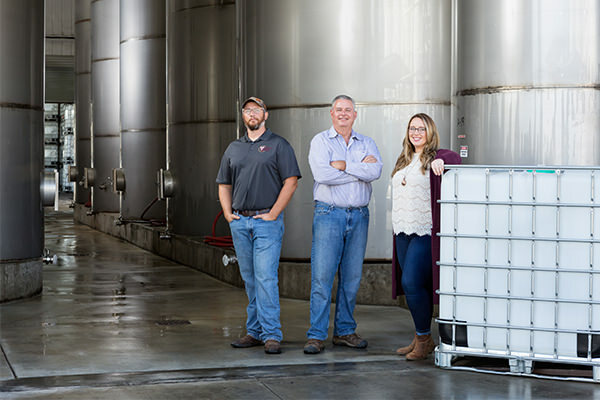 Today, wineries across the United States use our varietal grape concentrates and grape juices to supplement their needs and enhance their wines. Wine concentrate can add sweetness, balance acidity, and round out the wine, especially on the mid-palate. Home winemakers use grape concentrates to not only produce their own wines, but also to develop their skills and expand their knowledge of winemaking. The food and beverage industries are able to utilize grape concentrates as natural grape products. Advances in processing technologies and improved viticultural practices have led grape quality to improve year after year. Through research we have determined that grapes used for our varietal juices and concentrates require less pesticides and gentler agricultural practices which, in turn, protect and preserve our environment. Our goal is to offer the best winemaking products available on the market by using sustainable farming and manufacturing processes while reducing our carbon footprint.